The USS Shaw exploes in drydock at Pearl Harbor. 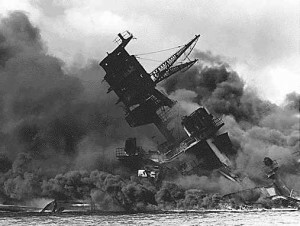 Dec. 7, 1941. 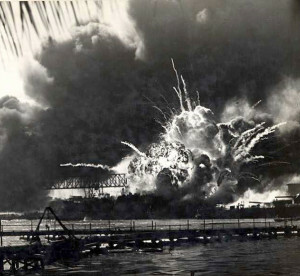 When Japanese Naval aircraft attacked Pearl Harbor on the morning of Dec. 7, 1941, they also attacked U.S. Army Air Forces flying fields and facilities as well. Only a handful of U.S. pilots got airborne to fight back. The most famous were two young pilots named Welch and Taylor. At Wheeler Field, 2nd Lieutenants George Welch and Kenneth Taylor were awakened by the scream of aircraft engines and the sound of exploding bombs. Running outside, they saw smoke rising over Pearl Harbor and Japanese planes bombing and strafing targets all over the islands. They both were less than a year out of pilot training, and, like all personnel at Pearl Harbor, neither was psychologically prepared for a shooting war. Nevertheless, with Wheeler and Hickam Air Fields in flames, Taylor recalled there were planes at the grass field at Haleiwa, 10 miles from Honolulu, where the 47th Pursuit Squadron had been sent for target practice. They quickly pulled on their tuxedo pants and, while Welch ran to get Taylor’s new Buick, Taylor, without orders, called Haleiwa and ordered the ground crews to get two P-40 fighters armed and ready for takeoff. Driving at top speed to Haleiwa, they survived a strafing attack and found the strip untouched. Without permission or knowledge of the enemy situation, they took off with only their .30-caliber guns loaded. Near the Marine airfield at Ewa, they attacked a formation of Kate dive bombers that was strafing the field. With three of his four guns firing, Welch shot down one Kate, as did Taylor. Turning to get behind another, Welch’s P-40 was hit by an enemy tail gunner. He ducked into a cloud to check his plane. Then both lieutenants returned to the Pearl Harbor area, where each man downed another enemy pilot. Low on ammunition, the two landed at Wheeler Air Field to rearm. Taylor had been wounded by that point and was bleeding. While ground crews were rearming the planes, Taylor got lectured by a senior officer on his behavior. At that moment the Japanese attacked Wheeler again. That scattered the crowd, and Taylor and Welch took off. The wreck of the USS Arizona burns as the Japanese attack Pearl Harbor, Dec. 7, 1941. Taylor hit some ammo carts as he lifted off but he was soon airborne guns blazing. Even as they took off, the wave of enemy bombers escorted by Mitsubishi A6M2 Zeros swept over the field. Flying into the enemy formation, Welch shot a Zero off Taylor’s tail, then nailed another attacking plane before returning once more to Haleiwa to rearm. By the time they were airborne for a third time, the Japanese armada of some 350 aircraft had departed for their carriers, leaving the U.S. Pacific Fleet in ruins, and having destroyed most of the U.S. military aircraft parked wingtip-to-wingtip as a safeguard against sabotage. Only the 46th and 47th Pursuit Squadrons had been able to get fighters into the air. Welch is generally credited with shooting down the first Japanese aircraft in the Pacific War, followed seconds later by Taylor’s initial victory. 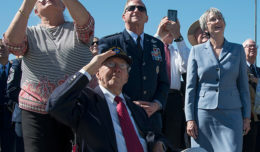 Both pilots were awarded the Distinguished Service Cross. Later, Welch was honored by President Roosevelt at a White House ceremony. 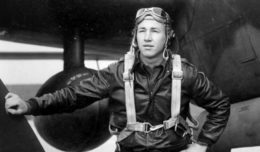 Welch’s four confirmed victories in his first combat experience were an illustrious start for a distinguished war record as a fighter pilot that was to span the next two years in the Pacific. Official records credit Taylor with two kills. He probably had two more, although in the heat of the battle he didn’t see the planes hit the ground, and potential witnesses were too busy to keep track. Welch was credited with four kills. Officially, American aircraft losses were placed at 188 destroyed and 159 damaged, while the Japanese lost 29 planes. 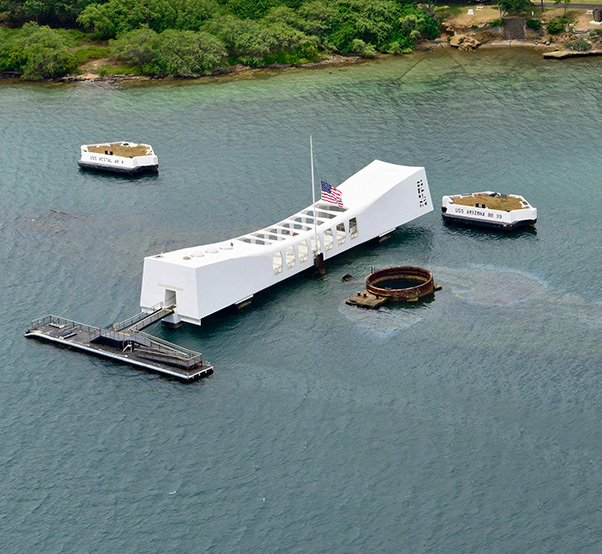 The USS Arizona Memorial at Pearl Harbor, Hawaii.